Hair is the valuable asset for men as loss of it can dent their self-esteem and attractive personality. Even hair loss can become the obstacle for the career of youngsters. So going hair can be the matter of concern for everyone and noticing the abrupt and continue hair loss can be disturbing for all. Hair loss can be the problem for both men and women so they both look for the reliable option to restore their lost hair and confidence. 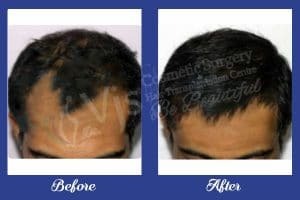 Hair transplant is the widely proved and accepted method for hair restoration in a surgical way. In last few years, hair transplantation is getting manifolds as people are preferring the surgical hair restoration. It is not the complicated procedure and even not much expensive so becoming the ideal solution for baldness. Hair transplant in men can give the natural and permanent results for the common pattern hair loss problem in men. Crown baldness and every Norwood scaling level of hair loss can be cured with this surgical hair restoration method. Men can have the solution for their bald spots or even severe baldness with this procedure. How Men Hair Transplant Done in Andhra Pradesh? This process is extremely advanced and simple in which the grafts are extracted from the donor area on the basis of their loss resistant properties. Then the extracted hair follicles are transplanted in the bald areas. Before the surgery candidacy of the men are evaluated so that safe and reliable results can be obtained. Men that have stabilized pattern baldness can undergo this procedure without any worry about the reliability and feasibility of results. The men of age more than 20 and with the best health condition and favourable medical history can also be ideal candidates for transplantation. Steps For Men Hair Transplant in Vizag? After the careful extraction of grafts, the harvested grafts are preserved in the hydrated solution so that their loss resistant properties can be retained. Then the grafts are placed in the small holes or slits that are created with extreme care of experienced surgeon at the correct angle, distance and depth. Transplantation of hair follicles is done without leaving any hole and wasting of grafts according to the density required.